Customer: Long Standing UK customer for Operational UK which lead to an order with European counterparts. Operational UK have a valued list of long-standing customers who consistently choose Operational as their trusted engineering partners. One long-standing partner based in the UK recommended Operational to their counterparts in Amsterdam. The client is an International coatings manufacturer providing large scale foil, lamination and holographic printing services to its customers. The project entailed the urgent relocation of a 3 canister, 30,000 Nm3/hr capacity regenerative thermal oxidiser (RTO) and ancillaries to another location. Operational were able to pool resources and respond to the urgent situation immediately. They provided a full turnkey, project managed service from start to finish. Organising every detail from road closures to transportation. 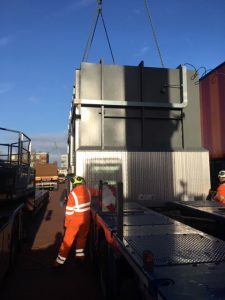 A total of 50 Tonnes of equipment was dismantled and relocated safely including the RTO, buffer chamber, fan, stack, duct work panel, wiring and containment. 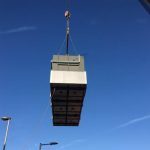 ‘All mechanical and electrical equipment was cleared out after being made safe in a 2 week turnaround’ said Dave Barker, Operational Engineer and project manager on this project. Every business faces unique challenges. The key to success is finding partners who can integrate with them. At Operational we use expertise and ingenuity to deliver a complete solution engineered around your challenges, and the opportunities they provide.